Rubs are a mixture of herbs, spices and seasonings applied liberally to the surface of meat, fish, poultry and seafood before grilling or roasting to enhance and complement flavors. They help form a desirable crust on the outside, and can also be applied under the skin of chicken or turkey for additional flavor. There are no rules as far as what goes into a rub. It’s just a matter of personal preference, so experiment with countless flavor combinations. A dry rub is a mixture of dried herbs and spices, often including salt and sugar, that is best used when cooking at higher temperatures. Dry rubs adhere to the natural moisture on the surface of foods. A wet rub is a mixture of dried and/or fresh herbs and spices as well as moist ingredients such as oil, mustard, horseradish, minced garlic or soy sauce. 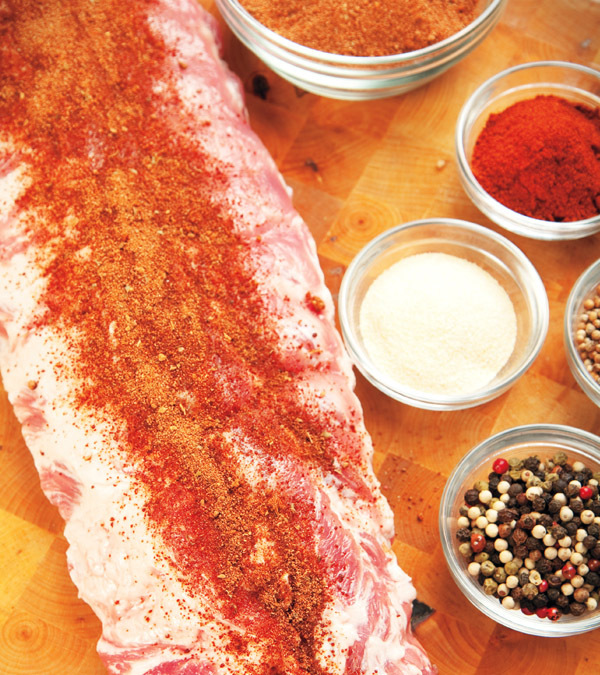 Wet rubs are ideal for slowly cooked foods such as ribs, pork chops and bone-in chicken. Marinades are typically a mixture of three components: an acidic liquid, such as fruit juice, vinegar or wine, oil and herbs and/or spices. The acid helps tenderize the meat, allowing the flavors of the marinade to be absorbed. Due to the acidic nature of most marinades, foods should be marinated in a nonreactive glass, ceramic or stainless steel container; aluminum can leech a metallic taste into foods. The purpose of the oil is to help seal flavors into foods while keeping them moist. Marinating time is dependent on the strength of the marinade and the food being marinated. Strongly-flavored ingredients, such as soy sauce, spicy chiles or liquor, can overwhelm the taste of foods if marinated too long. Highly acidic marinades can actually begin to “cook” some meats and seafood, breaking down its fibers and altering the texture. If the marinating period for meat, poultry or seafood is one hour or less, the food can remain at room temperature. For more than an hour, cover tightly with plastic wrap and refrigerate.